Bread and butter could be what you toast and eat for breakfast each morning or a hip way of saying what you do to put food on the table, but food phrases such as this one could serve as a lens into the alarming obesity epidemic in America and who could be a better choice to Co-Chair the President’s Council on Fitness, Sports and Nutrition (PCFSN) than U.S. Olympian, Dominique Dawes? As an Olympic medalist and U.S. Gymnastics Hall of Famer, Dawes’ career is a testament to the kind of success that results from hard work and dedication. But perhaps to her fans, what makes Dawes a champion is a combination of her athleticism and her advocacy on important issues that range from health and fitness to self-esteem and equality. In an exclusive interview for The College World Reporter, which follows this article, Dawes sat down with publisher, Donell Edwards, to discuss her Presidential Appointment and the importance of educating young Americans on how they can lead healthy lifestyles. “Well, you know, the core mission of the council is to get America more fit,” she said, “we live in a nation right now where 1 in 3 young people ages 2 – 19 is overweight or obese,” she continued. The Council that Dawes and Brees head consists of up to 25 volunteer citizens and a host of famous chefs, doctors, personal trainers, and athletes have already come on board (fitness.gov). “It’s going to be number one about educating people, empowering people to get out there and work out, and also trying to ensure that to be a healthy member there are some things they ought to change,” Dawes stated as she spoke on ways the Council will seek to fulfill its mission. Aside from her Presidential Appointment, Dawes recently added medal number three to her trophy collection from the Summer Games in Sydney 10 years ago. According to Washington Post writer, Amy Shipley, the International Olympic Committee’s investigation of an under-aged competitor on team China, resulted in a late announcement of their disqualification of third place. “Almost all of us were crying,” Dawes said in the article as she described the celebration that she attended along with her former teammates and coach back in August, it “was just a special moment,” she finished (The Washington Post). 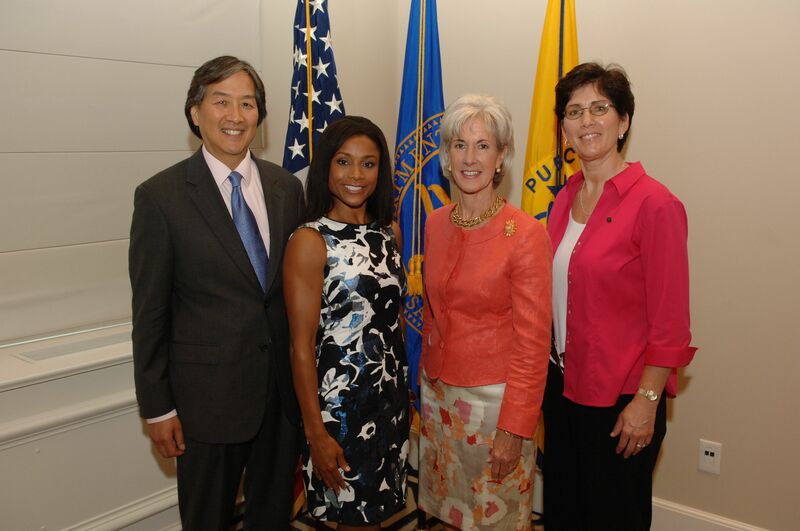 Interestingly enough, Dawes is a champion on many fronts and her wealth of knowledge and experience should serve to benefit the PCFSN as it seeks to engage, educate and empower Americans on the importance of regular physical activity and good nutrition. For more information on PCFSN and to discover more on how you can get involved, be sure to visit www.fitness.gov and www.presidentschallenge.org. Ms. Ward is a graduate of the School of Journalism at Cheyney University in Pennsylvania. Ms. Ward is a proud recipient of an Ed Bradley Radio Performance Award for “Best Overall Production,” the President’s Award. Ward has worked as a producer, host and engineer for WCUB Channel Four at Cheyney. Also, she was asked to write the introductory piece and introduce media mogul, Paul Bennett to her “Writing for Print Media” class. Ward is a member of the Keystone Honors Academy, Alpha Kappa Mu, and President of Alpha Nu Rho, Cheyney University’s chapter of the International English Honors Society, Sigma Tau Delta. Among other things, some of her works have been featured in local and international publications such as “A Profile of Edmonia Lewis, the First African American Sculptress” in Alpha Nu Rho’s Literary Voices Journal. She recently completed Middlebury at Mills College Seven-Week Spanish School in Oakland, CA where she made tremendous progress in her pursuit to achieve fluency in the Spanish language. Ward aspires to be a Foreign News Correspondent. Exclusive interview with three time U.S. Olympian Dominique Dawes with The College World Reporter Founder and Publisher, Donell Edwards. 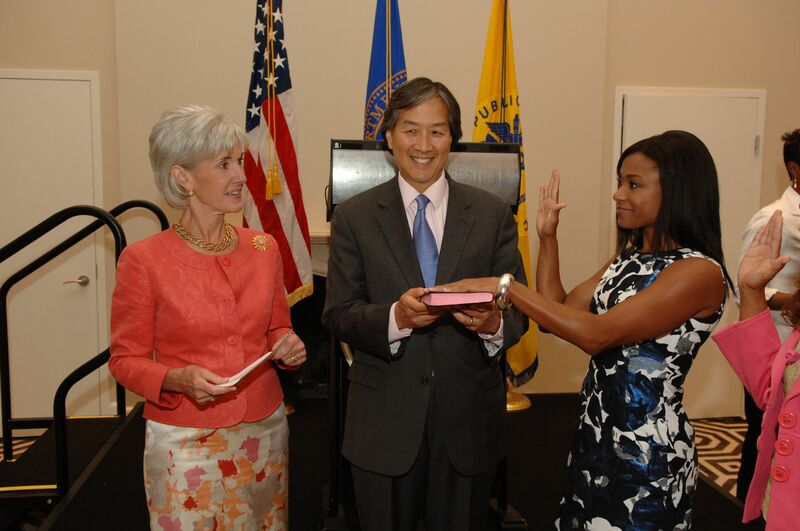 DE: On June 23, 2010 you were appointed as one of the Co-Chairs of President Obama’s Council on Fitness, Sports and Nutrition, along with quarterback Drew Brees of the World Champion New Orleans Saints. What is the mission of the council? Ms. Dawes: Well, you know, the core mission of the council is to get America more fit. Like, we live in a nation right now where 1 in 3 young people ages 2 – 19 is overweight or obese. We know that as we look around, many people are not only unhealthy where you can see it on the outside, but on the inside. And so, we need to, with the help of this council, and the president wants this done, for us to not just focus on getting people physically active and getting them outside and running, he has added nutrition to the council. So fitness plus nutrition makes people realize that it’s not just about getting out and running, getting a health club membership, as most people think, but it’s also about being smart about what you put in your body. And so, being a council member and being a co-chair along with Drew Brees, we are really excited to take charge and help America, not just young people, but adults as well, become a healthier individual. And we know we can only do that not only by educating and empowering people, because a lot of people don’t know about food. They don’t know what protein and what carbohydrate and what a calorie is. People also don’t know the benefits of cardiovascular working out, and also the importance of adding good muscle tone and muscle mass. It’s gonna be number one about educating people, empowering people to get out there and work out, and also trying to ensure that to be a healthy member there are some things they ought to change. Until we understand that we can educate and empower people on the importance of fitness and nutrition, that when we go to the grocery store the healthier options are more expensive, it’s gonna be very difficult for people to move away from the higher processed foods. And they are more affordable right now. So we need to make sure we’re changing policy. When you go into the school system today. junior high, high school, and elementary school, there are so many junk foods; sodas and everything that are offered to young people. And of course as a young child if you offered that to me and I really wasn’t educated on the benefits of healthier food, I would choose the junk food, why? Because it really does taste better, if you have not been exposed to good healthy food options. So, it’s not just about educating and empowering, it’s about changing policy, to ensure that the school has fresh food and vegetables. DE: So a lot of the focus is on education, but also changing policy? Ms. Dawes: It’s education, it’s informing people, it’s empowering people, motivating people, to make these subtle and small changes to their daily regimen. To go for a walk during the afternoon, to cook together as a family and let’s try healthier food options. Try to explore and try different things, and like I said, policy change is good. DE: How has being a world-class athlete prepared you for your role on the council? Ms. Dawes: It prepared me not just for my role on the council but honestly for everything in life. It’s not even about being a three-time Olympian. All of my very close friends are individuals that trained with me in Maryland. And the majority of them, like 99.9% of them did not make the Olympics. But a lot of them did qualify and get a college scholarship, earn a college scholarship. And so, when we sit together and we can chat, we talk about how wow! School prepared us for life. It taught us about how hard work does pay off. Sport also taught us to be disciplined. We had phenomenal coaches that pushed us to our limits and even beyond at times. So we developed a huge respect for authority, also realizing that we need someone to help us reach our goals. And so, hard work, commitment, determination, desire, being goal-oriented, and of course working while, with fatigue. Because in life it’s really hard to reach your full potential or, maybe be successful in the world’s eyes, alone. And so, sport taught us all of that and I honestly wouldn’t have changed anything in my 18 year journey in the sport of gymnastics, because I have developed so many qualities that have helped me today. DE: You alluded a moment ago to two of the major health problems that affect many Americans, in particular young people, and that is obesity and the other one, which I don’t believe you mentioned, is diabetes. We are particularly interested in informing our readers about the affects of obesity in youths and juvenile diabetes. What can you tell readers about the causes and affects of obesity first of all. Ms. Dawes: Well, I mean, obviously people know that, as I mentioned before, 1 in 3 young people 2 -19 are overweight. And we need to change that by diet changes, we need to change that by including more physical activity into their daily lifestyle. Now when it comes to diabetes, what’s scary today is that when I was growing up Type 2 diabetes was called adult onset diabetes. But now, because so many young people are developing Type 2 diabetes, it is no longer referred to as adult onset diabetes. It’s just called Type 2 diabetes. And that’s occurring because of lifestyle choices. Now, some people may have diabetes as something that runs in their family, and maybe may become more susceptible, and I’m not a doctor. However, through the research that I’ve done and what’s been provided to me, Type 2 diabetes develops because of lifestyle choices; choosing to be sedentary, choosing to eat unhealthy food, not choosing to be healthy. And many times when an adult or a family member, like a parent, mother or father, that’s close to the kid, develops Type 2 diabetes and is overweight, there is an 80% chance that kid will become overweight or obese in life, and early in life. And so, the thing is it’s scary, it’s alarming, and just recently I was in Florida for a speaking engagement, and I was speaking to a pediatrician, and she had said that this is something that America really needs to take notice of. Because this is the first generation of young people that will not live as long as their parents, because of their physical health concerns. Because of being overweight, because of developing Type 2 diabetes, because of developing the onset of cardiovascular disease at such a young age. So, it is alarming and that is why I am so thrilled to co-chair this president’s council, because it is really an opportunity for us to save the nation. DE: So essentially what you are saying is that most of us can protect ourselves by making the correct choices and lifestyle changes, correct? Ms. Dawes: I mean, it’s all about the Type 2 diabetes, and being overweight and obese. And if you look at your family history, you might be more susceptible to developing certain things. If both parents are overweight, or maybe you took the genes of a parent that is overweight or obese. Be smart about what you’re gonna put in your body. Be smart about choosing to be a little bit more physically active and just take those small steps. It’s not about let’s go to the gym right away and work out 60 minutes a day. I understand if someone has not worked out in years, or it’s not something they enjoy doing, but it’s probably gonna to be a challenge. But it’s like taking that step of doing 20 minutes of walking a day, even if it starts off at a slow pace. Instead of having that cheeseburger at McDonald’s or whatever fast food restaurant you may go to, opt to get the grilled chicken sandwich. I still go to McDonald’s, I go to Wendy’s, McDonald’s, I go to fast food places because why? It’s quick and easy. But, I will choose the grilled chicken sandwich without mayo, at McDonald’s. I will get the apple slices, and I will get the Dasani water. Every now and then I will splurge and get that h-u-g-e thing of sweet tea. It’s probably way too many calories, but it’s once in a while, and that‘s all that we want to encourage people. It’s like making the smart choices, moderation is key, don’t have that sweet tea or that soda everyday, moderation is key. DE: In order to effectively combat these problems, obesity, diabetes, I would imagine it requires a united effort that involves everyone. So, let’s talk about the role various groups can play in fighting the alarming increase in juvenile diabetes and obesity among youths and young adults. First of all, what can parents do? Ms. Dawes: Well just the other day I was speaking specifically to parents and I was saying how it is important for us parents to realize that we are role models, and I believe parents understand that and respect that. And for so many years they’ve realized that, oh, what I say to my child will be absorbed by them, or, the example that I set in regard to self-esteem or work ethic will be observed by the kid and usually demonstrated. However, do not forget, that you are a role model when it comes to what you are eating at the dinner table. You are a role model when the kid looks at you and sees that you are consuming sodas all day, or not working out, or overweight, or just living unhealthy. You are a role model, and I always encourage parents, and even aunts and uncles, or people that really care about kids, or work with kids, teachers as well, make sure you present a positive example for them. You are making those healthier food options and you’ve shown that in front of them so they can see that you are eating healthy foods, that you’re working out, and that you really do care about your physical health, and I believe that our young people will then start caring about their physical health too. DE: When we look at children, teens, young adults and the role they play in living more healthy lives, it reminds me of the days when I was on the football team at my school. I was in the best physical condition of my life because we had a very, very rigorous conditioning routine. I also made the choice to eliminate all sugar, all soft drinks, high fat foods, etc., and I had a very healthy and balanced diet. Because I wanted to excel as an athlete. I had a purpose, I had a cause. How do we give young people the motivation to live healthier lives? Ms. Dawes: That is a very good point that you made. Earlier this year I had gone to Oklahoma City to help kick off the Let’s Move Oklahoma City Riversport Challenge. Let’s Move is an initiative that the First Lady started specifically to combat childhood obesity because it is alarming. And at that event I spoke to kids because I realized, we’ll learn from our parents, we’ll look and observe what they’re doing, and of course if they give us only healthy food options at dinner, that’s all we can choose from. You know, which is good. However, many times kids need a little bit of a motivation, you know, a motivating factor. And I talk about the importance of having dreams and goals. Because just as you were when you were younger and aspiring to be a great football player, I was the same way when I was a young gymnast. And I remember getting taught at a young age that fast food is not gonna help get me to the Olympics. And that fast food is not gonna give me the healthy energy that I need to endure a seven hour gymnastics training session. And so when I was young I never knocked out a particular food group, I never avoided certain things, but I truly began convincing myself that, you know what, if I eat this food, my dream’s not gonna come true. So I quickly developed a distaste for many different foods. I never, cared to have cake on my birthday. I was like, uh uh, that is not gonna be for me. And of course all my teammates had birthdays and I never had cake, during their birthday parties as well. And so, the thing is, warn kids, it’s important to them to focus on what do they want to be when they grow up. What do they want to aspire to become? Either if it’s in athletics, in arts, or academics, and then realize you know what, if you have a healthy body and a healthy mind, it’s gonna help you get there a little faster. And so maybe then they’ll think a little bit more about, OK, let me make some healthier food options, and then I can achieve my goal. And I think that’ll truly motivate our youth. DE: You mentioned previously about schools and the unhealthy food that is available to young people, and how susceptible they are to giving in to what they like. But we also hear reports of some schools removing soft drink machines and replacing them with juice vending machines, and other schools replacing traditional menus with healthier more nutritional menus. Can you give other examples of what schools are doing, or can do to provide students with more healthy food options? Ms. Dawes: Recently the First Lady, in support of the Child Nutrition Act, which is about doing just what you said, getting off of fast foods, getting junk food out of schools, getting soft drinks out of vending machines, filling it with water; plain old H2O. And giving kids more healthy options to choose from. And that’s what is occurring right now. Another thing as I mentioned earlier, getting fresh fruit and vegetables into the schools. Schools need grant money for that, and this bill, the Child Nutrition Bill, will provide that. I believe it’s $4.5 billion dollars to go to schools nationwide to change the look, the feel, of the food industries in the schools, to ensure that our kids are actually given a chance to be healthy. And it’s not just about, oh well, make us more choice, but at school you only have a choice of chicken pot pie, tater tots, pizza, and soft drinks. Then it’s really, really hard; you know it’s really hard. And so, I’m happy to hear that many adults are getting out and taking a stand, and I’m sure parents have stepped in too, like hello, my kids need to have healthy food options at school. And so, with that said, there are going to be many more healthier options in schools. It’ll probably take a little bit of a while, but yes, schools have already taken, some have taken soft drinks out of the vending machines, some have taken a lot of the chips and everything out of the vending machines. And then some have really started to make a change with their physical activity programs. PE (physical education) today is not mandatory, and it’s not even offered five days a week, in many, many schools across the nation. And I remember when I grew up, I remember recess, I remember PE, I remember trying to learn how to play football and I hated it. I could not catch that ball to save my life. It was frustrating for me, but it was fun, and it was helping me to remain fit. And today kids are not getting that opportunity. They’re maybe getting PE once or twice a week, and so that’s another thing that’s going to be addressed later on. DE: The lack of physical education in our schools is one of my pet peeves. We’ll discuss this at length later. However, continuing the discussion of what parents, schools, and the food industry can do to help win this war, and that’s what it is, a war to combat unhealthy lifestyles and return to a healthier way of living, requires a united effort. I commend some of the fast food restaurants and what they are doing with their menus, such as including milk, juice, and fruit in their kids meals, adding salads to their menus, and so forth. Some of the snack food companies are offering baked items in addition to the fried products we are accustomed to. There are more healthy options now, so change is occurring. But is this just superficial, or is there more that we should ask from the fast food chains, the snack food companies, and the soft drink companies as parents and consumers? Ms. Dawes: A change in marketing! If you look at how foods are marketed today, I think that fast foods and snack foods are the least desirable. You know, I think that’s something that I want. If you look at the commercials that kids are viewing each and every day when they are watching television. So that’s one thing that needs to be addressed, marketing, healthy food options to children. Not once in a while, but all the time. Not just focusing on sugary cereals, or the fast foods, or the yogurt that’s full of sugar or what have you. But really getting fruits and vegetables in there and marketing it to young kids, kids that are in pre-school. Because they look for what they see on TV and they know, wow, I want to try that, that looks good! And right now if you watch, let’s just say watch a day of children’s programming, and you’ll see right away, sugar, sugar, sugar, fried, fried, fried. And lots of kids are then told that that’s desirable, and that’s the thing they go after. And so, I do commend the fast food industry for making changes. I’m currently watching “Super-Size Me” (http://www.snagfilms.com/films/title/super_size_me/), for like the seventh time. And that is a phenomenal movie that I recommend. It talks about how this young man consumes McDonald’s food for 30 days straight. And he is gaining a lot of weight. And it’s not only affecting him externally, but it’s affecting him internally. And, the thing is if you eat McDonald’s each and every day, which most of us do not, this is what’s gonna to happen to your body. So it makes you think twice about consuming fast foods regularly. The thing is from that, McDonald’s no longer has super sizes anymore. They have now incorporated more nice, healthy options like the apple slices. They have Dasani water that they sell, they didn’t sell bottled water many years ago. I tend to go to Wendy’s a great deal I get their salads, I love their baked potatoes, I love their grilled chicken sandwich because it comes with honey mustard. And so, the thing is, the fast food industry has made changes, and I commend them unto the council. You know, seeing what they’re doing, but you can always make more changes. DE: I hadn’t thought about the marketing and that’s an excellent point. I assume that’s one of the things the council will be doing, looking at the fast food and snack food industry marketing to children? Ms. Dawes: You know, I wish I could tell you. But I will guarantee you that I will bring it up and I’m sure someone else will to; you know, the marketing. Because, that’s crucial, the average person is watching hours of TV a day, and it’s feeding their minds, and from that it’s gonna be feeding their bodies unhealthy. DE: What was the name of the movie you mentioned? Ms. Dawes: “Fast Food Nation” (http://www.foxsearchlight.com/fastfoodnation/). It’s about the gentleman that’s supersizing everything at McDonald’s. “Food, Inc.” (http://www.topdocumentaryfilms.com/food-inc/) is another movie that I just saw. It’s a good one as well. Getting the background on the agricultural industry, and how that’s, you know, affecting so much. DE: Lets move the conversation to dieting, and talk about exercising and being active. Many people think the only way to lose weight is to go on a diet, and there are literally hundreds of diets that people have tried. What are your thoughts on dieting? Ms. Dawes: I think the thing is to maintain healthier choices. And if you really mean to lose weight then it takes obviously eliminating certain junk foods, eliminating it for a while. And having grilled chicken, having steamed or raw vegetables, making those smart changes; having milk and water. And if you are going to have fruit juice get a juicer. And so the thing is it’s all about how you feel making those smarter choices. And moderation is key. I know whenever I travel the country, especially when I go to Europe, I lose weight. And it’s not because I am out there walking all the time. The thing is their portion size, is just enough for us to survive. So if you go to Europe, you’ll have slightly more than half, maybe, of what they serve in America. So you come back to the states and you then realize, oh my goodness! We’re being overfed. You know when I was younger, my grandfather and my parents would say, don’t you get up off that kitchen table until you’ve finished your food. So whatever is on my plate, I’ve been taught to consume, and devour. And the thing in America, they give us nearly twice as much food as we truly need to survive. And so the thing is moderation is key. And there are so many websites that really talk about when you look at your dinner plate or your lunch plate, how much you can have as far as protein, I think it’s a fist size. Ball your fist up, and that’s how much protein you should have on your plate. For vegetables, spread your hand out, for vegetables, it should be that much on your plate. And so the thing is it’s like, realizing OK, how do I learn these simple things and incorporate them into my daily lifestyle? And at this point, making those healthier choices, and cutting down the amount of food you have, you won’t ever need to go on a diet, because this has become your lifestyle. DE: When we consider exercise and being active, what do you recommend so that busy people find the time for exercising and being more active? in my living room when I’m watching a little bit of TV. And so, it’s just finding those ways to get in 30 minutes, 60 minutes, and then making it truly a part of your lifestyle. It should be just a part of your lifestyle as everyone knows you wash your face and brush your teeth. You should know that everyday you find a way to get in that 30 to 60 minutes of physical activity each and everyday. And not only will you see a difference, but more importantly you will feel a difference. DE: I mentioned previously that one of my pet peeves is the lack of physical education classes in most schools today. There was a time when physical education was a requirement, and the President of the U.S. had a program supporting PE in the schools. What happened? And as a member of the President’s Council will you make a recommendation to restore regular physical education to the schools? Ms. Dawes: Oh of course. It’s a no brainer that we need to ensure that kids are not only being fed properly in school, but obviously moving. Someone said it best and I don’t know who it was, that the whole no child left behind, really left every child on their behinds. Because no child left behind puts all the funding toward academics. And I understand that the United States is obviously struggling and we need to make sure our kids are being taught properly, our test scores need to be higher; in relation to the rest of the world, we are not doing so well. Now we’re one of the richest nations, yet we are still struggling, our kids are still struggling, and we’re failing them. And we need to change that. However, when you take the funding away from one side of the, one fund pot, that pot that’s lost the funding is going to be neglected in physical activity. The thing is, kids may be getting smarter, but they’re getting fatter. And so, we need to find a way to balance it, we want our kids to be smart. We know that academics and knowledge is the key to success. I’ve heard that since I was growing up. When I signed a full scholarship to Stanford University in 1994 I believe that was one of the proudest moments of my coach’s life. Though I ended up going to two more Olympic games and graduated from the University of Maryland College Park, but it was instilled in me that education was important. But the thing is we need to make sure our kids are told that their physical health is important too. And that it’s not about learning how to throw a football, it’s not about kicking a soccer ball, but it’s really about getting them physically active, and helping them learn the values that we spoke about earlier, about the discipline, the commitment, the teamwork. They need to learn that from the physical activity. And so the thing is, we need to stress the importance of academics, but also show our kids, that being involved with moving their bodies and being involved in some sports is key. And I think, for young kids, it is about sports. It’s not about, oh let’s have them run around a tree a couple time. Because I remember, you talking, you just said there was the President’s Challenge, that still does exist. It’s presidentschallenge.org, people can still win a PALA award, it’s the Presidential Active Lifestyle Award. It is still something that people can earn even on their own outside of their school. But the thing is, I remember seeing girls and boys, when we were doing the mile run test, standing behind a big tree. And they would tell me, “Dominique, let me know when you’re on your last lap and I’ll come running around.” So, a lot of kids were not necessarily taking that seriously. You know, and I understand there was a test, and you like received a score card, and good, great, not so good. So we need to have our kids in organized sports and they need to learn about working with teams, they need to learn about challenging themselves, they need to learn about winning and losing, because that’s what life is about. And so, I feel that when we get together as a council coming up in the next month, that will be something that we all will be stressing. What direction, what mission do we need to communicate, really to the schools? What do we envision? How do we find a way to fit PE back in schools? And so, that will definitely be, I will guarantee it will be on our top 10 list. DE: How can our readers help you and the other members of the President’s Council on Fitness, Sports and Nutrition accomplish your mission? Ms. Dawes: To get more information on the council go to fitness.gov, and that’ll be helpful because they’ll really get a better understanding of really what the President’s Council on Fitness, Sports and Nutrition is all about. And they’ll find areas where they can volunteer or events that we’re going to be doing. Also, go into presidentschallenge.org. I think that will be key as well because organizations can find ways to be the President’s Challenge advocate. So that’s non-profits, that’s schools, that’s corporations that have lived up to a certain criteria that they have committed their organization, their group, to becoming physically active. And so, there’s ways that they can even be acknowledged by the President. Not only can they use the President’s Council seal, but they can get recognition from President Obama saying really congratulations for caring about your physical health, for caring about your organization’s overall health. And so those are two websites that I would highly recommend your readers go to, fitness.gov and presidentschallenge.org. DE: In conclusion, what message or advice would you like to offer to our readers? Ms. Dawes: Well they are still in college and so I would say, outside of the whole health and fitness focus, I would say truly, we are not in a very prosperous time right now, and many college students are graduating from college and there are not jobs waiting for them. And so my advice to students that are still in college is to take advantage of the environment that you’re in, and utilize college truly as a springboard to where you want to get later on in life. And it’s not just about your GPA and everything like that is truly very important. But it’s also about your network that you develop through college. It’s about the relationships that you build, and I’m not talking about the relationships when you’re partying. I’m talking about the relationships you have with your professor, the relationships that you have with the administration at the school. Take part in functions where you go out and you meet other people, either other young professionals, or other older professionals in the corporate world or in organizations that maybe you have an interest in. And so it’s all about, I feel, while you’re in college building a stronger network. Get involved in clubs. I missed out a lot in college because I really didn’t have a normal college life, I was traveling every week to speaking engagements and speaking to CEOs of companies and their marketing teams. And I was making great money, and that’s what I thought college was about. Oh well! I gotta go speak to the marketing team at Mass Mutual because it’s my job. But the thing is, it’s about building relationships so that when you get out of college you have a strong network of people that you can go to, either to get advice, either to get maybe a job, or anything and everything to focus on helping you move down your career path. So, I always try to encourage young people, of course get good grades, and focus on what you’re doing. But don’t forget, utilize the college network that you have around you. And groups are the easiest and best way to do it. About Dominique Dawes: Ms. Dawes is a three time U.S. Olympian and the first African American to achieve an individual medal in gymnastics, winning the bronze medal, with her performance at the 1996 Atlanta Games, where she also won team gold as a member of the “Magnificent Seven” U.S. team. She also won team medals in all three Olympic Games she competed in, becoming the only American gymnast to do so and has a permanent place in the U.S. Olympic Committee Hall of Fame. 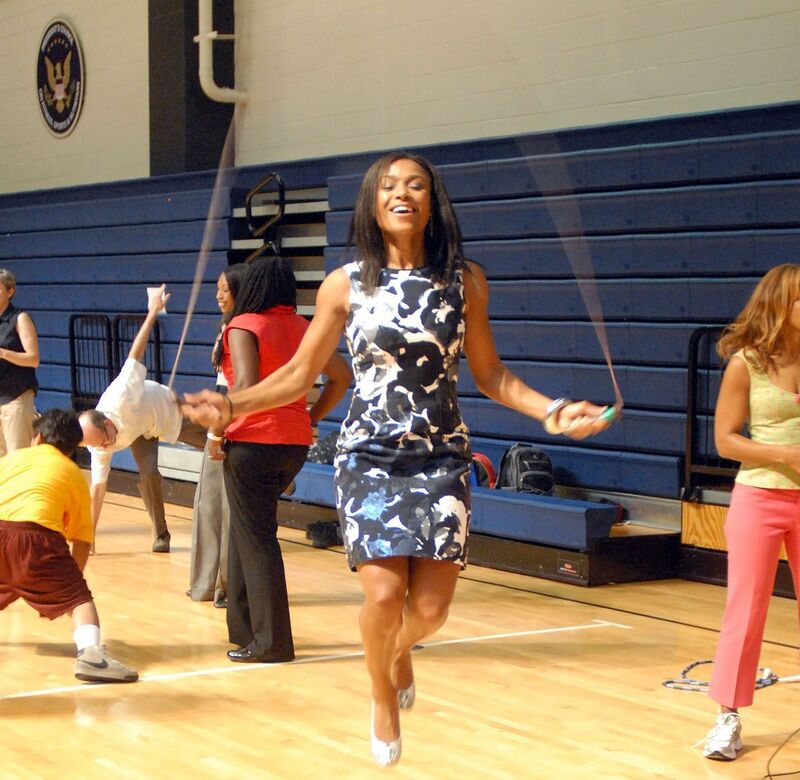 She was appointed by president Obama as Co-Chair of the President’s Council on Fitness, Sports and Nutrition. Ms. Dawes has been a motivational speaker for 14 years.